In India, migration is a common practice, particularly for boys ages 8-14, due to limited income opportunities and access to quality education. Boys will often travel hundreds of miles to work in brick kilns, construction sites, textile factories and other industries, not realizing the inhumane working conditions that await them. Traffickers make promises of good work and pay, but those who migrate instead find long hours, low wages and poor living conditions. Isolated from their families, these children become even more vulnerable to further exploitation and trafficking. 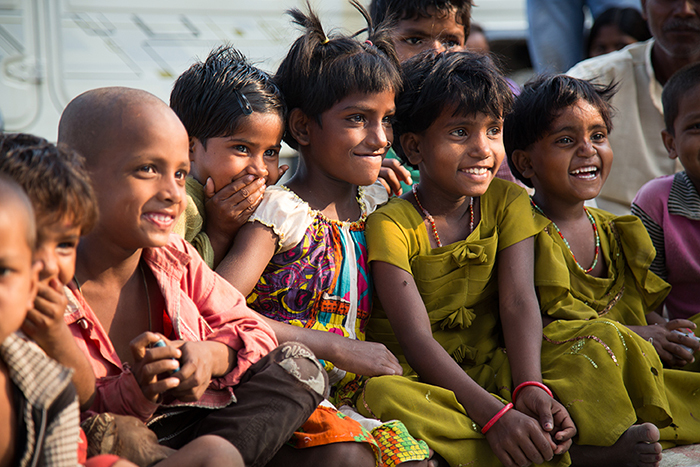 CRS is working with partners in Bihar, India to educate communities and bring an end to child labor trafficking. Together with the Fakirana Sisters' Society and the Bettiah Diocesan Social Service Society, CRS is raising awareness about the dangers of migration and trafficking through community interventions and livelihood support. By helping children stay in school and protecting them from exploitation, these villages are giving hope and a future back to the youth searching for a way forward. 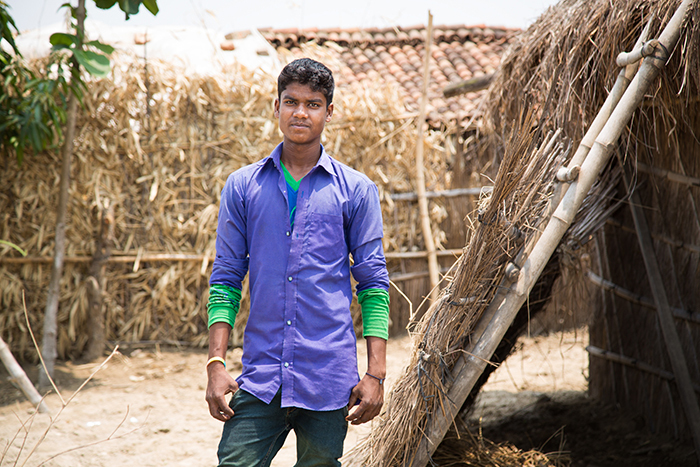 Manjay (14) has expressed a desire to leave school and migrate for work, believing he will have better opportunities to earn an income. 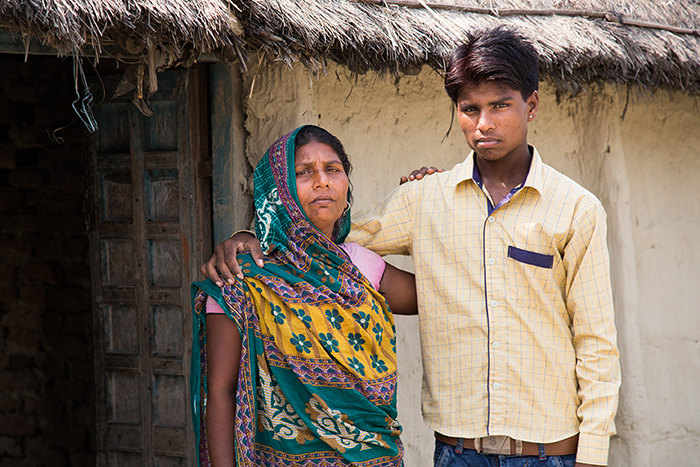 Sunil (15, right) planned to leave his village in Bihar to work in the city to earn income and help his widowed mother. From left, Arajun (15), Karan (15), and Hemraj (15) were trafficked out of their village of Kaili-Gohti Tola to work difficult jobs. They were able to return to their homes, and now they educate others about the truths and dangers of trafficking with the support of the Bettiah Diocesan Social Service Society. 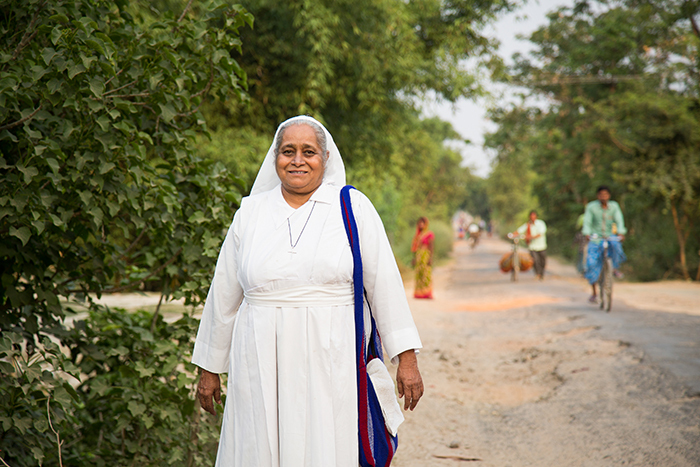 Sister Mary Elise of the Fakirana Sisters’ Society works to educate children and their families about the dangers of trafficking and importance of finishing school. Upendra (13) participates in the Bachpan project, which is run by the Fakirana Sisters’ Society. One day Upendra was returning home from the market and saw a trafficker pushing 3 boys onto a bus. He alerted program officers with the Bachpan project, allowing them to intervene and prevent the boys from leaving. 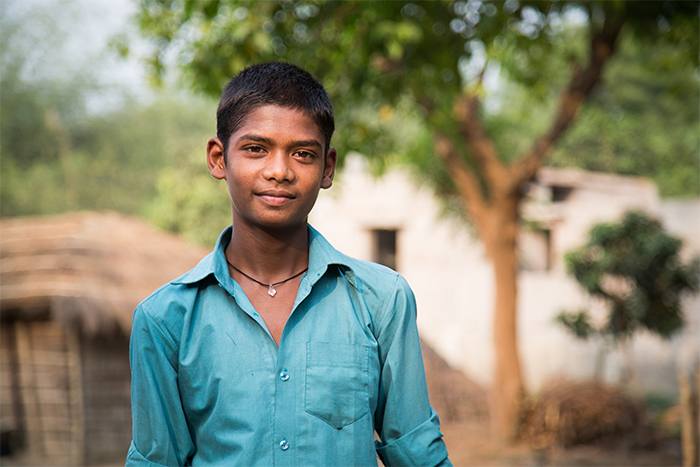 Due to Upendra's efforts, Sunil (left) and Dasrath (15, right) were prevented from being trafficked out of their village. Unfortunately a few months after their rescue, both boys migrated again because of grinding poverty at home and opportunities in the city. While keeping adolescent youth at home is challenging, the Fakirana Sisters’ Society is starting a new skill training program to help tackle the problem. Bachpan means “childhood” in Hindi. 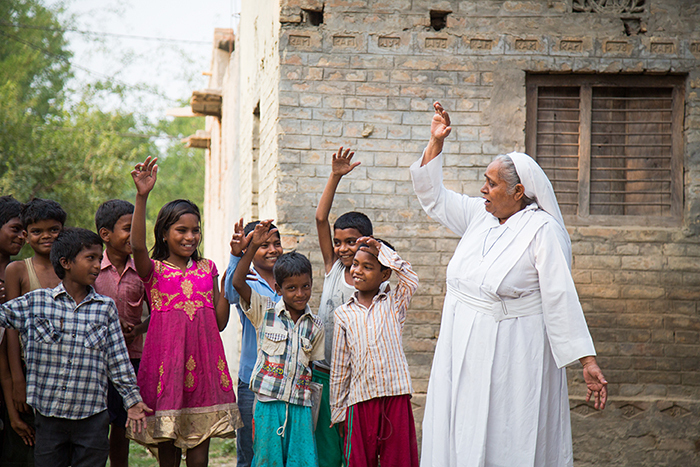 Sister Mary Elise of the Fakirana Sisters’ Society spends time with children in a village in Bihar. It is her goal to work with parents to teach them the importance of children staying in school rather than working. Triveni (left, 11) and Premshila (13) were orphaned at a young age. Despite Triveni’s dreams of becoming a doctor and Premshila’s hopes to become a tailor, they withdrew from school without the money or motivation to sustain them. But with support from the Bachpan project, they have re-enrolled in school and are excited to resume their studies and become peer leaders in the community. Hemraj (in red) and Anil Uroan (in blue) perform a play based on their experience of being trafficked and working in a rice mill for 12 hours a day. 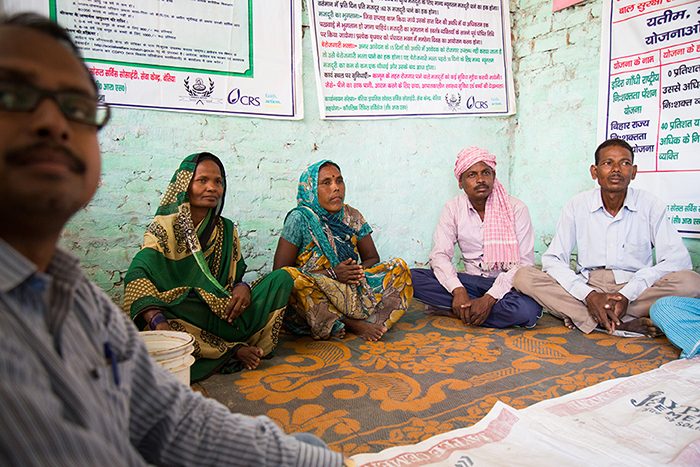 Through interventions such as this, the Bettiah Diocesan Social Service Society is able to educate communities about the dangers of trafficking. 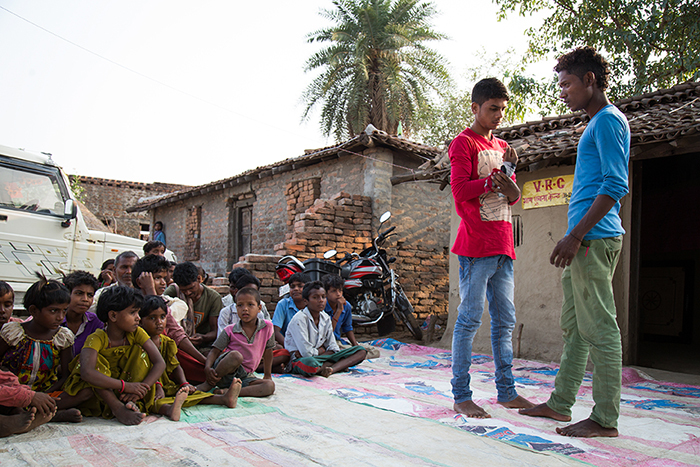 Children gather in the village of Kaili-Gohti Tola to watch a play put on by 3 teenagers who were trafficked out of their village for hard labor, sponsored by CRS partner, the Bettiah Diocesan Social Service Society. Project leaders of the Bettiah Diocesan Social Service Society meet with members of the community to discuss problems and solutions particularly related to migration and trafficking. Ramu and Gauda’s children have migrated for work, but they have learned the importance of education from the Bettiah Diocesan Social Service Society and are determined to help their grandchildren finish school. 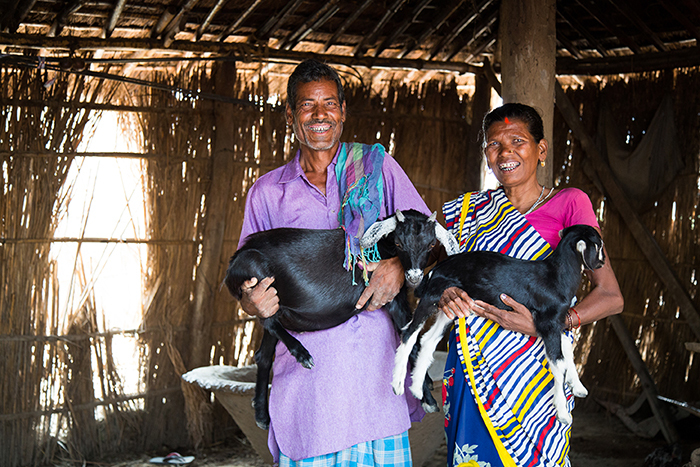 The Bettiah Diocesan Social Service Society has also helped them with immunizations to keep their goats healthy, an important supplement to their income. 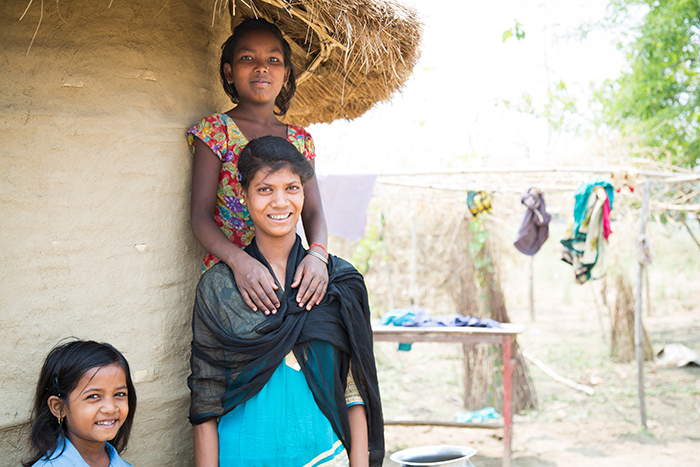 It is common for girls to leave school and get married at a young age, but because of anti-trafficking programs, Naina (center, 12) and her family have learned the importance of finishing school and want Naina to finish her education.